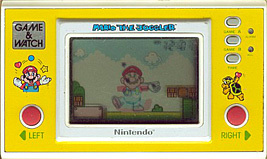 The final Game & Watch game to be released is based on the very first: Ball. Mario is juggling a heart, a star and a ball. Move Mario's hands to juggle the items in the air. In Game A, Mario only has to catch three items. In Game B, there are four items (two hearts) and a Lakitu and Hammer Bro. join in to catch the Hearts, changing the timing of the juggled items. In Game A you score 1 point for every catch, and in Game B you score 10 points.